As the first in her family to attend college and from a disadvantaged community where few students think it is possible to leave, Carolina Martínez Orozco wanted to prove that you can leave, and succeed. She also wanted to come back and encourage others. “It was always my goal to go to college outside of Los Angeles to focus on my studies, but it was also my plan to return to my community,” says Martínez, who graduated a year and a half ago from Smith College, a private women’s college in Northampton, Mass. “If I had stayed in Los Angeles, I do not think I could have focused one hundred percent on my studies, so I decided to go out and get to know another environment,” said Martínez, the eldest of four siblings and the daughter of Mexican immigrants. Martínez was born and raised in the Watts area of South Los Angeles, a neighborhood with few opportunities for advancement. She attended LA Unified schools: 96th Street Elementary, Charles Drew Middle School and the magnet school at Jordan High. Her idea of returning to her community once she graduated from college became a mission for her, because she not only wanted to return to be close to her family, she was also determined to help other young students follow in her footsteps. So during her senior year, she applied to be part of City Year Los Angeles, an organization that is celebrating its 10th year in LA Unified, recruiting young college graduates to serve as mentors and tutors in the most disadvantaged schools and helping thousands of students graduate from high school. According to City Year, 1 in 4 students leaves school without graduating. Students who receive early intervention and individualized one-on-one support before 10th grade are four times more likely to graduate. Martínez asked to become one of those mentors, hoping to be assigned to work with students from her home community of Watts. Maricela Merino, a Jordan ninth-grader, said before she met Martínez, she felt unmotivated in her studies because she simply could not catch up with her classes, particularly in math. Merino now has the goal of going to college like her mentor and becoming a social worker. And her grades have improved. She said that since she began working with Martínez, she has gone from an F to a B in math. “Everything is thanks to her,” she said. City Year reported that students who receive support from their mentors are three times more likely to get better results on their standardized English and math tests and to finish high school. About 300 mentors assist students in 28 elementary, middle and high schools in Los Angeles, including Mendez, Jordan and Santee high schools and Carver Middle School. Martínez believes a lack of motivation is the most common problem among students in her community. “Most believe there is no future after graduating from high school.” She said that because she is close in age to the students she helps, the students relate to her and feel comfortable telling her about the many challenges they face on and off campus. “It’s hard to believe that students as young as 14 are going through so many academic and personal challenges. 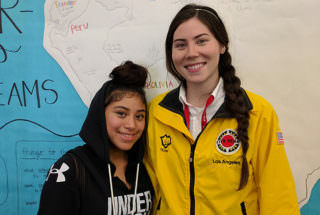 The best thing I can do for them is to listen to them and support them, telling them not to give up and to continue with their education,” said Martínez, who after completing her two-year commitment to City Year plans to become a high school counselor and work in her home community.